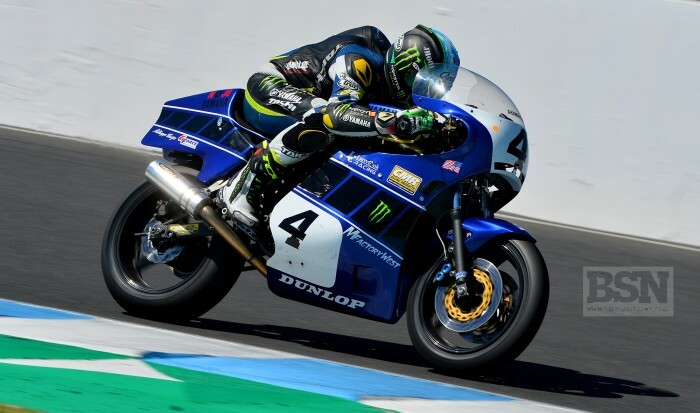 Phillip Island Classic debutante Josh Hayes today had a collection of small issues on track during today’s non-timed practice but nothing that can’t be ironed out by the four-time AMA Superbike champ. His Mojo Team brought a lot of motorcycles out to the seaside circuit, which means most of the riders are always going to have small issues with each motorcycle, because only so much attention can be given to all of them. “It’s small matter of making sure all the levers, shifters, and gearing all work. Then you have new people coming in and working on them. A lot of guys haven’t changed clips on needles or main jets or even turned the fuel on in ten years. So just a lot of little things like that needs to be sorted out,” Hayes explained to Bikesportnews.com. Once all of those issues are put aside, Hayes had to go and ride the Yamaha FJ machine, which sees him having to try to and get the shifter in a good position and figure out on track when he was moving about and how that will all work out. Hayes admitted, that he was a little lost on setup, because he has some ideas, but he don’t have enough time to really go and figure out how to lean on the bike and figure out what changes are actually going to help him and what the bike needs and doesn’t need. “It’s based on a feel in a short time,” Hayes said with a grin. In the four sessions today, the Hayes made a few mistakes, which saw him going straight on at turn four a few times, as he was struggling to get the bike stopped. Then he managed to get his best run through Doohan Corner in one of the session, only to go off at Southern Loop. In the final session the 43-year-old managed to get out and follow the 1999 Australian Superbike and 2009 World Endurance Champion, Steve Martin and a few of the other guys, who know their way around the 4.445km layout. “In the final session it was the first time I had actually followed someone who has done some laps around this track and be able to see what was going on. That has given me a few ideas on what I can work on for tomorrow,” explained Hayes. When Bikesportnews.com asked Hayes what he was hoping for in terms of a qualifying result for tomorrow, he openly said that he doesn’t know what to expect when he gets out there, as there was no timing today. If Hayes knew where he was and had a feel on what he could accomplish, maybe he could set a goal on a number on where he would like to be in the line-up. You watch racing all over the world and you see the TV views of the ocean in the back ground and just how fast and following the circuit is, and you think to your self – this is going to be a ‘bucket list’ track. Phillip Island is without a doubt a circuit that all race fans should check out. As this is Hayes’ first time at the Phillip Island Grand Prix Circuit, in fact the first time he is down under, he has expressed his excitement about being at the ‘Island’. Not only is the circuit new to Hayes, but so is the bike, considering all he has ridden in his career are modern day bikes. Ahead of the 26th running of the International Island Classic, Hayes did manage to go and meet up with his guys, who are spinning the spanners for him this weekend a couple of months ago at Thunderhill Raceway, located 7 miles West of Willows, California. “I did get to do some laps on the bike there and were surprised that the bike wasn’t too bad. The thing which I’m having the most difficult time with right now, are the brakes. I could definitely use some more brakes to get the bike stopped a little bit better,” explained Hayes. For the most part, Hayes’ machine hasn’t done anything too bad. It’s very stable and seems to have a good bit or torque. On top of that, it has surprised him as the bike is wheel standing out of a quite a few corners around Phillip Island. Two eight minute qualifying sessions is on the menu tomorrow, so it will be interesting to see where Hayes qualifies for the four six lap races this weekend.